An easy recipe for how to make Teriyaki Sauce. You’ll use this sweet and spicy glaze in stir-fries, on grilled meats, and for appetizers! Scroll down for a video tutorial. Sometimes you have to trade taste for convenience, but don’t make that trade today. Homemade Teriyaki Sauce will always be better than store-bought. Use it for your next stir-fry, yes. Of course. But dip grilled meats in it too, or drizzle it on a burger, or dip appetizers in it! This versatile sauce is as easy as it is delicious. How do you Make a Honey Teriyaki Sauce? I developed this sauce for my Hibachi Steak recipe. Inspired by a trip to the Cheesecake Factory, I knew I wanted to top my steak with a Teriyaki sauce so thick, it was more like a teriyaki glaze. 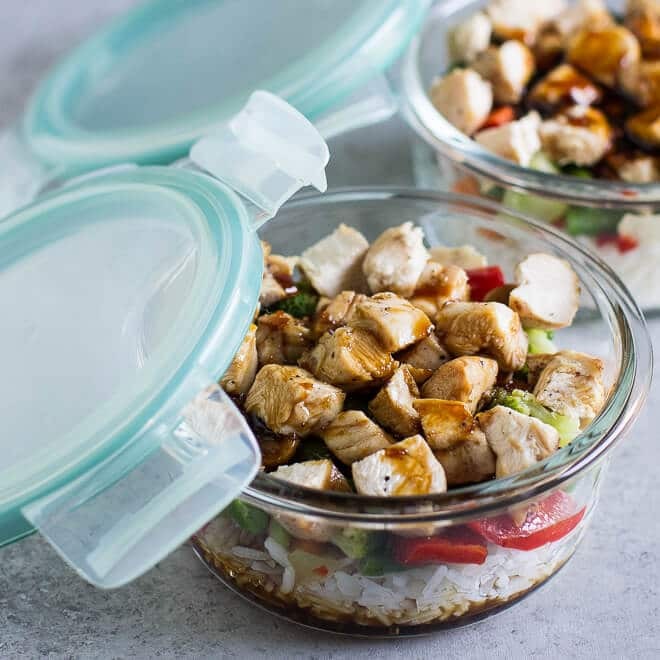 The best part is, this simple Teriyaki Sauce recipe comes from mostly pantry items. The only ingredient you’ll need to buy fresh is ginger (I make this statement assuming you have some kind of garlic around). Not familiar with mirin? It’s a Japanese cooking wine. It used to be really hard to track down, but now it’s at every grocery store in multiple brands. I love how the food evolution has made cooking easier! This is a great make-ahead sauce, too. You can keep it in the refrigerator for a week. Just bring it to room temperature before using! Need to know how to make a teriyaki marinade? Use this! Just marinade your chicken, beef, or pork in it for 30 minutes (or brush it on while grilling). 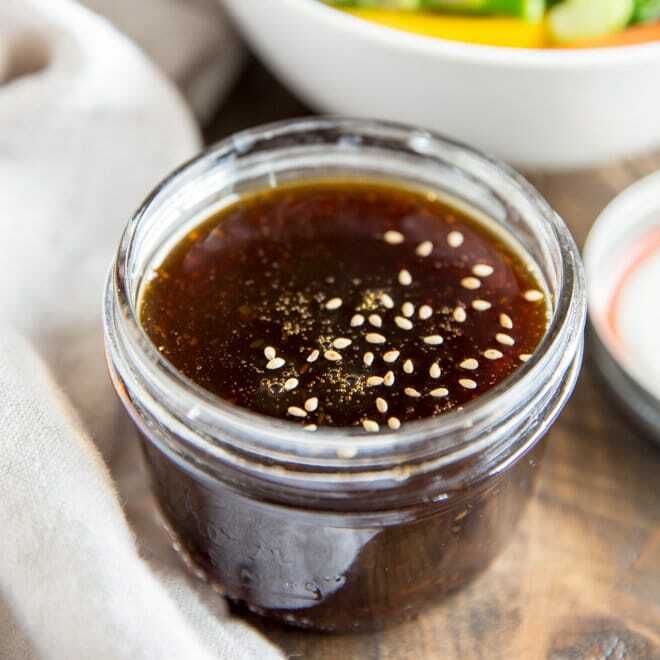 Save this Homemade Teriyaki Sauce to your “Sauces” Pinterest board! An easy recipe for how to make Teriyaki Sauce. You'll use this sweet and spicy glaze in stir-fries, on grilled meats, and for appetizers! 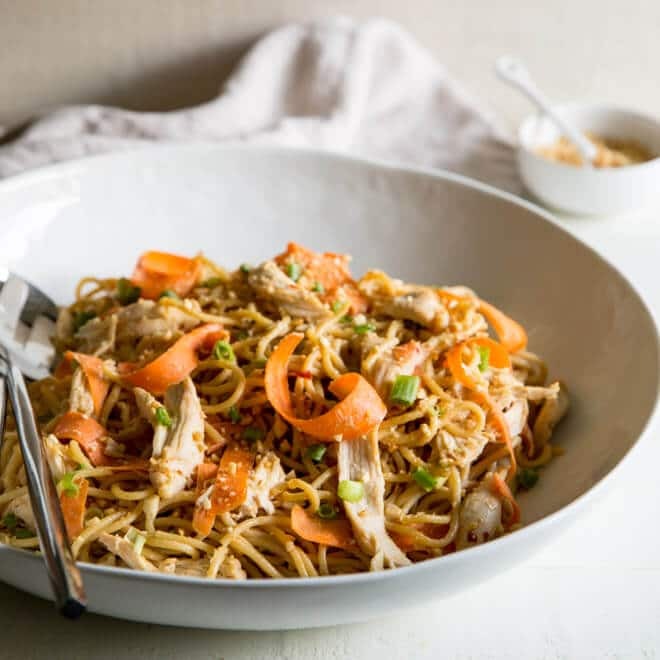 In a small saucepan, combine soy sauce, sugar, water, mirin, ginger, garlic, and red pepper flakes (everything except corn starch and honey). Bring to a boil; reduce heat to simmer. Remove 2 tablespoons sauce to a small bowl and whisk in cornstarch. Return to the saucepan and continue simmering until the sauce thickens slightly, about 10 minutes. Remove from heat, stir in honey, and cool to room temperature, or cover and refrigerate for up to one week. Bring to room temperature before using. 1 and 2 tablespoons of sugar to 1/2 cup of white wine. This is an awesome subsitution!!! Thank you so much. I’ve always wondered if there was something we could use instead. I will add it to this post and any others with Mirin. Thank you again! Prep time of 3 minutes including peeling and grating the ginger?? How fast are you?? Once brought to a boil even simmering hence will hold the heat. There is no way it will take as long as 10 minutes for it to thicken once the cornstarch mixture is added back in. It will thicken within 4-5 minutes. Allowing it to simmer for the extra 5-6 minutes however will allow the flavours to incorporate and mingle. I love the recipe. The use of mirin is a nice touch. On that note though you’re not doing the average home cook any favours by getting them to find mirin and then misleading them with the timings. Also it is pretty important to constantly stir the sauce while simmering in order to incorporate the cornstarch and keep your teriyaki from burning. This is a sweet sauce and is very prone to burning especially at the bottom of the pan and if left simmering for 10 minutes unattended. After the 4-5 minutes it will start to bubble and boil again too but keep the heat where it is and continue stirring. Admittedly I am writing this note before actually trying your method. So I will try what you have suggested and see if my 25 years as a chef have somehow failed me. I know my comments might come off as being a bit harsh but it is the truth. I’m just either the first person to read this recipe that has extensive knowledge or the first of a bunch to say something. Hi Ian! Thank you so much for taking the time to comment. Honestly I think your job as a chef is one of the hardest and under-appreciated in the world… although I hope that hasn’t been your experience. Regarding the ginger, I would remove the peel with a spoon and have it done in 30 seconds or less, and then grating 2 teaspoons on a microplane should take 2 minutes tops. But, maybe I’m just fast and I will definitely adjust the prep time. I appreciate the feedback! I am going to make the sauce again following the timing you have suggested and see what happens. Whenever I get questions like yours (or requests for substitutions or changes) I like to test the recipes again. By doing this, I find mistakes and other areas where recipes could benefit from more details or clarification. I’m sure you’re right about the timing on the sauce and I know for sure at least one time I burned it… but I left it unattended for 30 minutes boiling while something happened with one of my kids. But either way, I think the timing is more nuanced than I describe in the recipe. And you’re right, I need to pass this along to the readers. You aren’t harsh… let’s say refreshingly honest! Because you are a chef I love it. If you were some random person on the street arguing with me about food safety it’s just boring, but you obviously know what’s going on. So thank you. I will definitely work on the recipe (testing it out and explaining more details about the process). I’m so grateful to you, you have no idea. Thank you so much! Im not sure how but it ended up being way too sweet and had to throw it out, maybe I measured the sugar wrong who knows. :( I gave it five stars because I didn’t want to mess up your rating.